Despite Samsung’s insistence that it is not working on a premium Galaxy S5 experience, the rumors of said device aren’t going away. Details found on GFXBench indicate that the SM-G906S could be a variant of the flagship device. The difference, however, is that this model packs in twice the screen pixels and a different (2.5GHz quad-core Qualcomm Snapdragon 805) processor. At 5.2-inches, the 2560×1440 pixel screen would be the company’s first 2K display. It’s not a coincidence that this is the same resolution rumored for the premium Galaxy S5 (Project F, Samsung Galaxy F). For what it’s worth, we’ve also heard chatter that this device could employ a curved display. 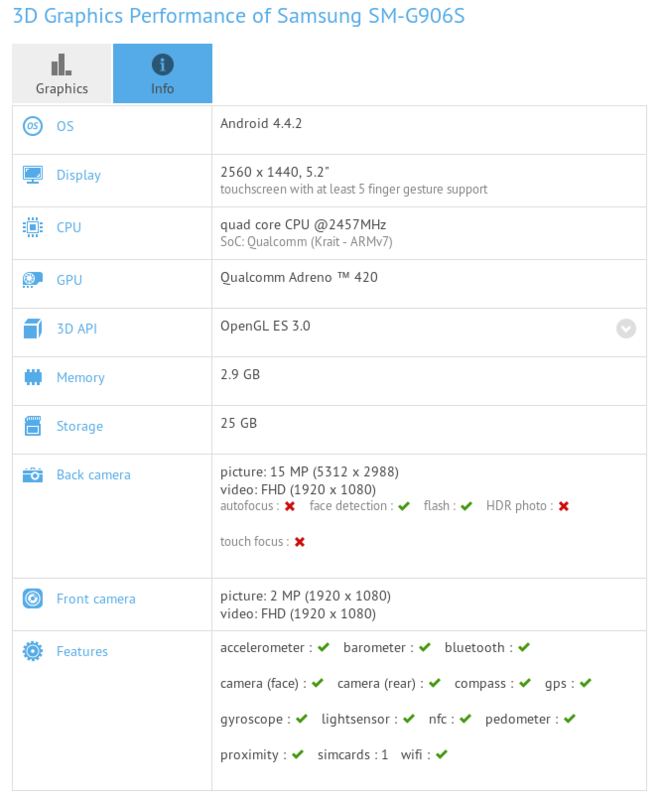 Other specifications listed in the benchmark website show the phone as running Android 4.4.2 and featuring a 16-megapixel rear camera and front-facing 2-megapixel camera. The model number very closely resembles that of the Galaxy S5 so we’re inclined to believe this is a twist on the standard model. We don’t see Samsung introducing a new line of products anytime soon. The post Premium Samsung Galaxy S5 rumors surface yet again appeared first on AndroidGuys.